Very often, dance has mesmerized me the way music does. Watching Odissi makes me sway gently in tandem with the dancer’s wave-like motions. I like the fluidity of this dance form as much as the elegant outfit and jewellery. If you are watching a live performance, try slowing down the shutter speed of your camera and you will see graceful curves and waves created by the dancer – just like the waves of the sea dancing gently on the fringes of a beach, perhaps in Puri. 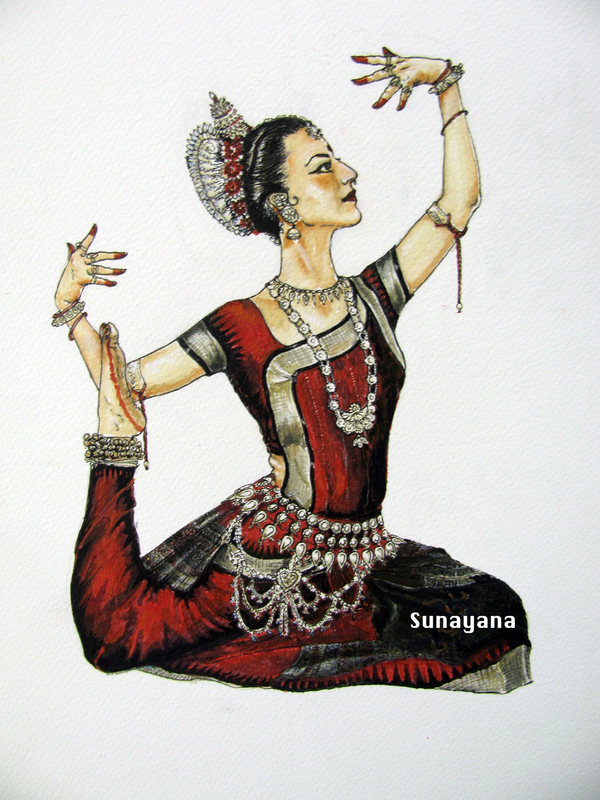 Danseuse Colleena Shakti is by far the most graceful Odissi dancer among her contemporaries. Although not Indian, her features do not clash with Indian costumes, which makes one focus on her evocative performance. Her physique is lithe and she looks like a goddess in her dance costumes. Her passion comes across beautifully on stage…and of course, I love it that she chooses her outfits so well. I have never been too fond of garish gold jewellery, always preferring the more low-profile white metal. Perhaps that’s why, Odissi, with it’s minimalist filigreed-silver jewellery and head-dress made of sola (a type of indian reed) and jasmine, appeals to me more than Bharatanatyam, with it’s heavy gold temple jewellery. I had challenged myself to paint a danseuse (specifically an Odissi dancer) in silk, floral and silver finery. Colleena’s photos immediately caught my fancy and this sketch was made from one of her online profiles. Here’s a link to Colleena Shakti’s biography and work. I sketched the entire figure with a pencil and then darkened it with a black microtip pen. The filling was done with watercolours. It took around two days to finish the fine details on the saree costume, especially the jewellery. What I liked so much about this photo, apart from the dancer’s gorgeous features, was the rich red costume. Although the face is not captured accurately, I thoroughly enjoyed the whole process of creating this piece. I do hope you enjoy viewing it as much too. Yes, Uday Narayanan….She’s amazing. Thanks for your comment.